Owing to its richly varied geographic features and favorable location in the tropics, the Philippines has been able to evolve and support generous numbers of plant and animal species throughout time. Owing to its richly varied geographic features and favorable location in the tropics, the Philippines has been able to evolve and support generous numbers of plant and animal species throughout time. This has also resulted in an exceptionally high rate of endemism, or the prevalence of particular species exclusively within the country’s geographic boundaries. In addition, the Philippines’s archipelagic composition and intrinsically small landmass contribute to a high density of species per unit area, making biological diversity in this country truly noteworthy. The Mt. Makiling area in Laguna alone, for instance, has more tree species than the (continental) United States does. The country, in fact, bears the distinction of being one of the 17 countries considered to be “megadiverse,” by virtue of it being home to 70-80% of the entire planet’s biodiversity. The concept of megadiversity and the list of the 17 countries identified as the world’s “biodiversity superstars” were established by Conservation International in 1998 in order to facilitate global conservation efforts. Estimating the actual numbers of plant and animal life is a daunting task for biologists everywhere around the world.The difficulty is attributed to such factors as the limitations in available research technologies and methodologies (although these are, of course, constantly being developed and improved), inaccessibility of certain parts of the biosphere (the deep sea and other extreme locations, for example), and even debates within the scientific community itself regarding the delineations among species. Much of the existing discussion has yet to even scratch the surface as far as micro-organisms (bacteria, protists, and algae) are concerned, in fact. Still, a tangible amount of research has already been done, and based on the results thereof, impressive findings about the inherent biodiversity in the Philippines has been – and continue to be – revealed. In 2006, Catibog-Sinha and Heaney wrote that an estimated number of over 38,000 vertebrate and invertebrate animal species have been described within Philippine territory, with over half being endemic species. The number of plant species, meanwhile, ranges over 16,000 based on the latest data (as of February 2013) published by the Department of Environment and Natural Resources-Biodiversity Management Bureau (formerly the Protected Areas and Wildlife Burea). About 45% to 60% of these identified native vascular and non-vascular plants are endemic to the Philippines. Estimates are even higher for flowering plants found within primary forests, as 70% to 80% are endemic species. On top of these numbers, the country also currently has the highest rate of discovery in the world – with no small thanks to its growing popularity as one of the world’s most biologically endowed, which has therefore inspired further research efforts. Indeed, among terrestrial mammals alone, at least sixteen new species have been introduced to science over the past decade. However, it’s not all good news. While researchers continue to introduce new species to science, contributing further positive developments for the state of the country’s biodiversity and endemism, the fact remains that the country also ranks among the most threatened ecological regions today. IUCN’s 2004 assessment lists down alarming numbers of highly threatened species among those known or described in the country: 52% for vertebrates, 68% for invertebrates, and 84% for plants. Several of the threatened species are endemic. It is also highly probable that many species will succumb to extinction even before they are introduced to science. If the situation is left unaddressed, the country is at risk of losing both its distinctive reputation as a world-class haven of biodiversity, but also its own homegrown natural heritage. Catibog-Sinha CS, Heaney LR. 2006. 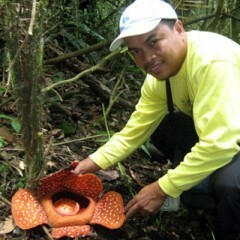 Philippine Biodiversity: Principles and Practice. Quezon City, Philippines: Haribon Foundation for the Conservation of Natural Resources, Inc.
Conservation International. 1998. Megadiversity: The 17 Biodiversity Superstars. Last accessed on February 13, 2014, http://www.conservation.org/documentaries/Pages/megadiversity.aspx. Department of Enviroment and Natural Resources-Protected Areas and Wildlife Bureau (DENR-PAWB). 2013. Status of Philippine Biodiversity (Updated as of February 2013). Last accessed on February 13, 2013, http://pawb.gov.ph/index.php?option=com_docman&task=doc_download&gid=724&Itemid=156. Baillie JEM, Hilton-Taylor C, Stuart SN, eds. 2004. 2004 IUCN Red List of Threatened Species: A Global Species Assessment. Gland, Switzerland and Cambridge, UK: IUCN. e-News Bulletin Join our mailing list today, and be ready for our next action alert. Enter a valid email address Enter your email address to receive regular news updates and announcements from FPE.